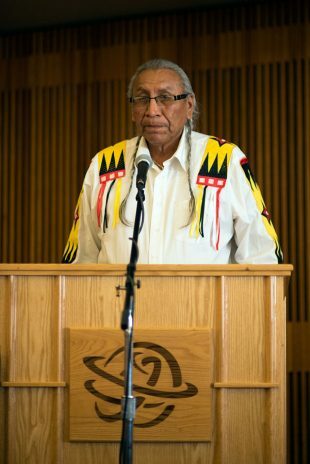 Chief Arvol Looking Horse, spiritual leader of the Great Sioux Nation, spoke to Salt Lake Community College students in the Oak Room on Thursday, Nov. 10. The Office of Diversity and Multicultural Affairs invited Looking Horse to speak at Taylorsville Redwood Campus to share his message of peace and address concerns that he has for the Earth and the people who inhabit it. Looking Horse was born on the Cheyenne River Reservation in South Dakota. At 12 years old, he became the youngest recipient of the Sacred White Buffalo Calf Pipe, which is used for the purpose of “peace and truth” and generally given to one of the highest leaders in the tribe. 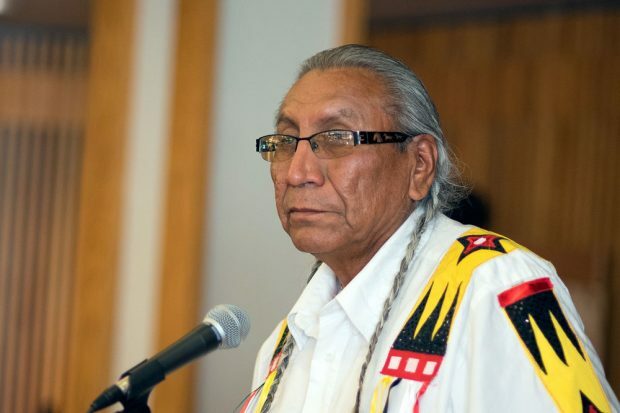 Looking Horse has served the Native American people throughout his life, often as a guest speaker at peace meetings between the U.S. Government and Native American tribes. He has also spoken at many worldwide peace gatherings, with spiritual leaders from around the world including the Pope, Dalai Lama, and leaders of various world religions. During his visit, Looking Horse shared his concerns about the Dakota Access Pipeline, a government project that would install a 30-inch oil pipeline over 1,172 miles. The project has been met with protests by the Standing Rock Sioux Tribe and other groups over the environmental, cultural and economic impact of the pipeline. At the time of this writing, the pipeline has been delayed by the Army Corps of Engineers, but no one is certain how long this peace will last. “We are at the crossroads of life. This is not a protest. We are protecting our family members, as well as The Master’s greatest creation,” Looking Horse said. Looking Horse then told a story of a black snake. The snake was very deadly, very poisonous. If it were to bite anything it would immediately contaminate whatever it touched. Running Horse explained that the winding snake wasn’t just this pipeline, but all of the roads and human creations that in turn affect how the Earth functions, and the very balance of our planet. “We live in a very busy world,” Looking Horse said before inviting his wife Paula to speak before the crowd. She congratulated SLCC students for caring for one another, and especially for caring for the world around them. She finished the talk by reminding all in attendance that we are but guests on this earth and that we should thank Her for allowing us to be here.